Your child will learn how to make, keep, and lose friendships over the next few years. It won't always be easy for her but talking to your child about her friendships is a great way to let her know you are there to listen and help. One day they are best friends. The next day they aren't speaking. Watching your child during recess would probably shock you. Not only do our children behave differently when we aren't around, they often have many mini-dramas throughout the day that we would never know about. Your child's ability to make and keep friends is very important to his self-esteem and success in school. Friendships can be very hard to navigate at this age because many children are still learning to manage their emotions and do not always remember to think of other people's feelings. It's a good idea to talk to your child about his friendships and school mates: who likes who, what games kids are playing, and so on. You may be surprised to find children at this age are very aware of friendships and relationships with their peers. This is also a time when you may notice some recurring issues or problems in your child's relationships with his friends. If your son often directs the play within his friendships and frequently tells the other children what to do, it's okay to talk to your son afterwards about being bossy. Our children need us to help them, even if it means we have to discuss something that needs improvement. A good way to help your child overcome a fault is to say, "everyone has something to work on, something they can do better." Maybe you can say that you are working on something too. This shows your child that it is okay to make mistakes but it is very important to take responsibility and make positive changes. When you notice your child isn't being as bossy with his friends, praise him for doing a good job. Ask if he still had fun with his friends and if he says yes, then make sure you point out that he can still have fun while playing by someone else's rules. Your older early years child may start to have play dates or even sleepovers. It's important that you and your child are comfortable with your child staying at a friend's house. There are things you can do to prepare for sleepovers and play dates and one of the best things to do is speak to your child and the other parent. Make sure your son is aware that he must follow the rules – even though he is at a friend's house. It's also a good idea to go over safety rules with your child. Let him know that he can call you at any time if he feels uncomfortable, sad, lonely or just wants to go home. Don't be surprised if you get a call to pick him up at bedtime as many kids have a hard time relaxing in a strange house once it's time for bed. Many parents do not let their child have play dates or sleepovers until they have met the other parent and feel comfortable with them. This is okay. You can always organize a family play date at the park or your house before allowing your child to stay at their house alone. Always check with the other parents to make sure they will be home during the play date or sleep over and let them know about any concerns you have about your child — allergies, fear of dark rooms, and so on. This way they will be able to provide a safe and fun environment and you can have a moment or two to read a book! If you are concerned about your child's adjustment to family changes such as separation, divorce, re-marriage or new siblings, know that your concern is normal and expected. Many parents wonder how their children will adjust to life changes. 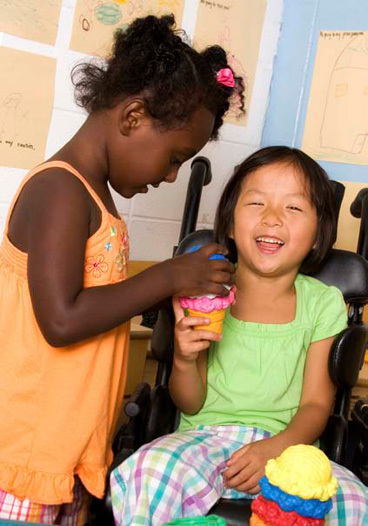 Just like adults, some children will have an easier time adjusting while others may have a very difficult time. When possible, talk to your child about any expected changes before they happen. Children may not be happy to hear about upcoming changes, but it will help them adjust when the time comes. You might have to help your child prepare by talking about what to expect. If a new sibling is arriving, for example, try to answer and anticipate any questions your child has about the new sibling, or about becoming a big sister or brother. Siblings at times can be the worst of friends and the best of friends. Sibling relationships can also be really hard to manage as a parent. Setting the tone for respectful, loving and caring sibling relationships can happen at any age. Help your children to work through disagreements and arguments using their words. It's also a good idea to explain how words and actions affect us. Talking about feelings may help your children to understand that hogging the video game, yelling or saying mean things really does hurt and siblings shouldn't hurt each other. Teaching your children to care for each other and helping them solve conflicts doesn't mean they won't argue or experience sibling rivalry. However, it will model problem solving, respect and healthy relationships. If you are separating or going through a divorce, talk to your child and let him know that the marriage separation has nothing to do with him and that both parents love him very much. You may also want to tell your child that the divorce is permanent. Try to retain as many routines as possible. Make sure your child knows he can ask you questions about the future and try to calm any fears he may have about the separation. Try to focus on the positives when talking to your child and speak kindly of your spouse in front of your child. You could reassure him that he will get to spend time with both of you and maybe he will have two bedrooms! Most of all, make sure he knows how much he is cared for by both parents. Jealousy between brothers and sisters is normal, especially when a new baby arrives. Family breakdown can be a time of confusion, sorrow and pain for all involved. Find out what supports are available during this difficult time. Raising a child on your own has unique challenges. The Parenting on Your Own handbook features many supportive resources available to you all in one place.